Ten Manti High School theatre students, their teacher and his wife stand in front of the Statue of Liberty during a recent visit to New York. Pictured from back row, left to right: Kory Howard, Tiffini Howard, Allie Swapp, Kirah Pratt, Beth Hughes, Abby Zedicher, Katelyn Allred and Marcus Bahlmann. Front row: Cari Carmody, Kodie Godfrey, Justin Bawden and Josh Douglas. MANTI—Ten Manti High School theatre students found their way on Broadway when they visited New York City last week. 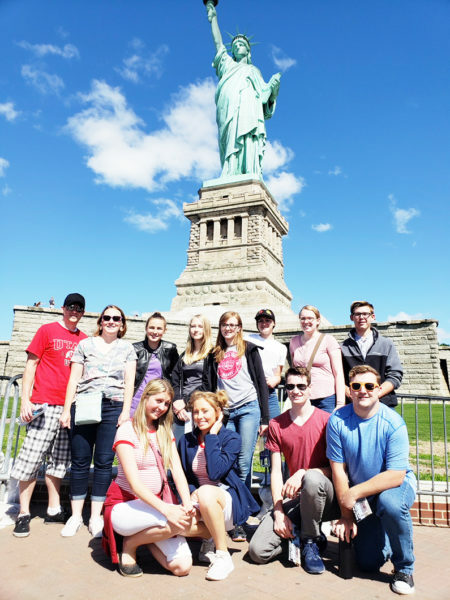 The ten students, along with Manti High theatre teacher Kory Howard and his wife Tiffini, spent five days experiencing the sights and sounds of the Big Apple. They embarked on Monday, June 11. In addition to visiting tourist sites such as the Rockefeller Center, the Metropolitan Museum of Art and the Statue of Liberty, the students participated in several theatre-related activities. On Tuesday, they went to a Broadway workshop and were able to meet with a cast member in the musical Anastasia. They also went to two Broadway musicals. “It was an awesome experience. I got to see things, do things and eat food that you wouldn’t be able to around here,” Kirah Pratt said. New York City has a population of 8.6 million and is home to people from many different backgrounds and cultures. The students visited Chinatown and Little Italy and were able to hear music and see art from these cultures. Even in places like Times Square and Central Park, they were among a diverse crowd of people going about their daily lives. “We don’t get to experience a lot of different cultures here, so it was cool to see,” said Hughes. Even when they weren’t busy going between famous tourist sites, they found plenty to do. The group spent part of an afternoon sitting under a tree in Central Park, saying hello to strangers and trying to make them smile. They often gave compliments and received back a mixture of confused stares and surprised grins. The trip was planned at the start of the 2017-2018 school year. Many of the students had been looking forward to the trip for months. The students felt a range of emotions leading up to the trip—excitement, anxiety, anticipation and dread. But the general consensus at the end of the trip was one of exhausted gratitude. “It was like moving out of the house and seeing what life can really be,” said Josh Douglas. They returned in the early hours of Saturday morning after a late-night flight, happy for the opportunity, but also glad to be back. “The constant movement of the city made me really appreciate coming back to the relaxed comfort of home,” Hughes said.